These lovely little gluten free vanilla sponge cakes are a delight to make and even more enjoyable to eat. These bit size cakes are big on flavour and fun. Try to find mini muffin tins if you can, as you’ll be sure to get loads of use out of them. Somehow indulging in a pint size treat seems less sinful than a standard cupcake size portion. They are also prettier and display well. These gluten free vanilla sponge cakes are ideal for baby, engagement or wedding showers. Preheat oven to 170°F or 375°F. In a mixing bowl, blend butter, sugar and vanilla until light. Add eggs one at a time and beat until combined. In a separate bowl, combine flour and gluten free baking powder and ensure evenly distributed. Add to butter, sugar, egg mixture and blend well. Fill a greased mini cupcake tin or greased silicone mini cupcake pan half way. Bake for about 15-20 minutes or until browned and a toothpick comes out clean. Let cool for a few minutes and gently remove from pan and rest on a cooling rack. 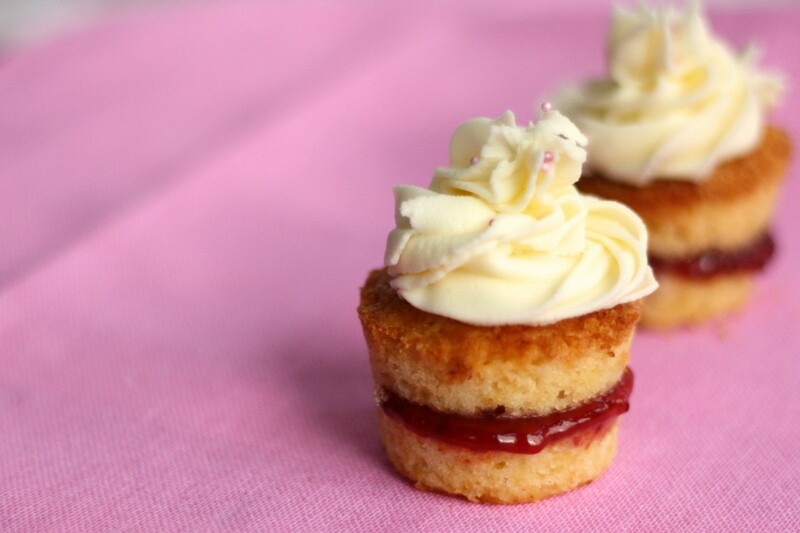 Cut the mini cupcakes in half and spread a thin layer of your favourite jam (I used raspberry but you could use strawberry or apricot jam for a different twist). Top with a swirl of vanilla icing and decorate as desired. Try something different and use Nutella or chocolate icing instead! No matter how you slice it, spread it, or decorate it, these little gluten free vanilla sponge cakes will be a sure fire hit at your next party. And by the way, no one will even know they are gluten free. It will be our little secret!